I thought the mini caramel apples mentioned on Party Perfect were a fabulous idea for any Fall party. They're exactly like the real deal, only smaller (and with a higher caramel to apple ratio, yum)! Here's a helpful recipe and tutorial from Sakurako Kitsu [original by Cat Cora]. 1) Wash and peel a large, fairly tart apple like Granny Smith. 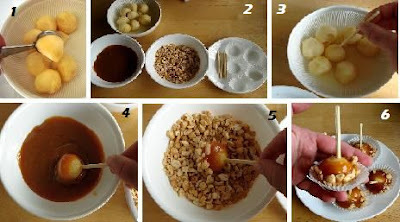 Using a melon baller, extract balls of apple. A large apple will yield about 6 balls (plus scraps for you to snack on). Place in a bowl and sprinkle with lemon juice. 2) Prepare a dipping station. You can use mini cupcake papers (as shown above) and lollipop sticks. In addition to a bowl of warmed caramel apple dip, you may want to add chopped nuts, m&ms or sprinkles. 3) Carefully spear each ball of apple through the ROUND end (not the part with the skin). Keep the flat end on the bottom, so they stand upright. Using a paper towel, blot off the excess lemon juice. This is important- if the apple has too much juice left on it, the caramel won't stick. 4) Dip the apple in the caramel, using a twirling motion to coat it evenly. 5) Transfer the apple to the nuts and roll, using a gentler twirling motion. 6) Stand the apples upright in the cups and let them chill in the fridge to solidify.